Description: Be nimble, be quick! Immaculate well maintained single story townhome with views of pool! Excellent floor plan with high ceilings, skylights, rock fireplace, wet bar, covered patios, large deck, double ovens, pull out pot racks, spice racks, breakfast bar, buffet counter with storage, split bedrooms, oversized rear entry garage with sink, workshop & extra storage, water softener & more! 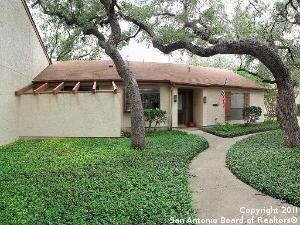 Fabulous location with easy access to 281 and 1604! Hoa fees cover exterior maintenance! Priced to sell quickly...Hurry!